The Coryhill Herd is a suckler herd. The calves are naturally reared by their mothers for at least ten months, late into the cows next pregnancy; hence the term ‘suckler beef’. 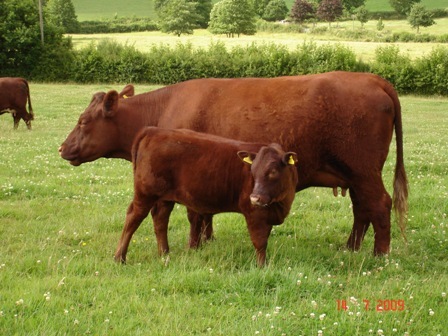 Red Devon cows are renowned for being ‘milky’ mothers. The majority of the calves are born and bred on the farm. Whitefield Ferdinand is our stock bull and runs with the herd during Spring and Summer. 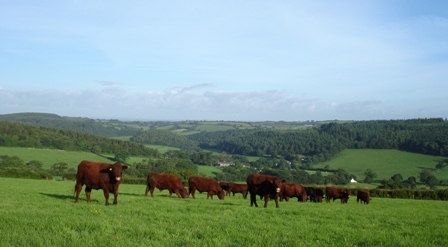 Weaned cattle are grown on for another twelve to eighteen months grazing on wild flower, clover and grass pastures in the the Spring and Summer. In the Winter months they feed on hay made on the same pastures. 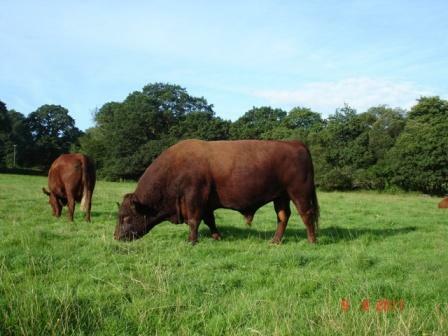 Unlike modern breeds destined for the mainstream market, supplements of cereal concentrates are not needed to finish the cattle; this would diminish the taste of the end product. Stock is taken directly to a local abbatior and butcher. The beef carcasses are dry hung for three weeks in a cooler to tenderise and become flavoursome. The process is called "dry ageing" because the meat drys as it hangs and some moisture evaporates. This process fell out of favour with mainstream processors and retailers in the the 1960's. The modern method is to plastic wrap meat immediately, this being more cost effective. However, this compromises the ageing and tenderisation process. The carcass is then butchered and individual cuts are vacuum packed and labelled. Available fresh or frozen to your door.